Santa Barbara Wine Country, From the Ocean To The Mountains, Beautiful! The Santa Barbara wine country is a special place. Its beauty and scenic roads run from the Pacific Ocean, and the wonderful city of Santa Barbara itself, to rugged mountains and fertile valleys. The city of Santa Barbara is a charming beach town north of Los Angeles. If you want to relax from the hustle and bustle of that huge city, Santa Barbara is the place to do it. If you are a wine lover, and if you are reading this you certainly are, you will be delighted by what the Santa Barbara wine country, with its nearby appellations; Santa Ynez Valley, Santa Rita Hills, and Santa Maria Valley, has to offer. Of the three main regions that comprise this area, the Santa Ynez Valley is probably the best known. To the east of the city, its warm weather is ideal for growing Bordeaux type grapes; Sauvignon Blancs, Cabernet, and Merlot do very well. This area is well established, with many outstanding wineries. In the city of Santa Barbara itself, you can visit the Santa Barbara Winery. It is the oldest winery in the area; though it was established in 1962, not exactly ancient! The Zaca Mesa Winery and Vineyard in the town of Los Olivos, has beautiful grounds where you can enjoy a picnic. The winery produces Rhone style wines. Andrew Murray Vineyards is another Los Olivos winery that you will enjoy. You will love their Syrah. 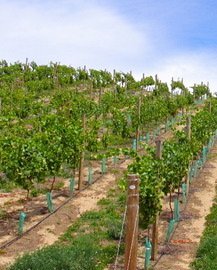 Santa Rita Hills is an up and coming wine region. To the north of Santa Barbara, the weather is cooler than in the Santa Ynez Valley. It is making a name for itself with production of Pinot Noir, as well as chardonnay and some syrah. Wineries of note are: Lafond Winery and Vineyard in the town of Lompoc. They produce Pinot Noir, Chardonnay, and Syrah. It has a lovely tasting room. Palmina Likes Italian style wines. Their specialty is Pinot Grigio. Babcock Winery and Vineyards is a small winery with fantastic wines. They produce mostly Chardonnay and Pinot Noir. Santa Maria Valley is the northernmost region of the Santa Barbara wine country. It is a large agricultural area. It enjoys cool weather, with chardonnay and pinot noir as its main grapes. Cottonwood Canyon Vineyard and Winery produces mostly Chardonnay and Pinot Noir, with a little bit of Syrah. Rancho Sisquoc makes a good Meritage, give it a try. If you are looking for a break from wine tasting, Santa Barbara wine country has charming towns and history. Visit the town of Solvang and you will think you are in Denmark. The city of Santa Barbara, of course, is a must visit, and a good place to stay. The courthouse is a beautiful Spanish style building with wonderful painted ceilings and tile work. There is much to love about a wine vacation that takes you to Santa Barbara . It is a beautiful area, where you can relax and enjoy the wine and the sites. Santa Barbara Wine Country, Relax and Enjoy.